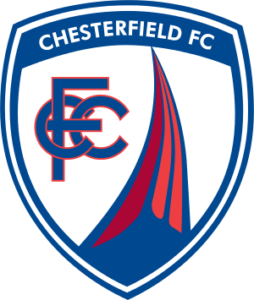 If you are going to the match at Chesterfield you may find the following information helpful. The ground is 1.4 miles from the station, a 30 minute walk. From the Railway Station follow the ‘Stonegravels Way’ footpath and cycle route that leads past the Chesterfield Hotel and up Brewery Street over the dual carriage way. Turn right down the steps and proceed along Infirmary Road past Chesterfield College and straight ahead along Canal Wharf. Where this joins Hazlehurst Lane bear right onto a new footpath which runs alongside the dual carriageway. Proceed until the footpath runs along the boundary of the Casa Hotel to emerge at Lockoford Lane where there will be the first sighting of the Proact Stadium. Please note if you are joining us at the Derby Tup, the pub is 0.4 mile further up Sheffield Road, past the ground. From the M1. Leave the motorway at Junction 29 at he roundabout take the second exit A617 its dual carriageway for 7 miles or so. At the end of the A617 get in the right hand lane and at the roundabout take the 4th exit the A61 north dual carriageway. At the next roundabout take the first exit at the Tesco’s roundabout. Gordon Lamb garage on the left. Donkey Derby on the right. At the next roundabout take the 3rd exit and drive along the B6057 Sheffield Road. You should be able to see the ground on your left just past Tesco’s entrance. Follow the A61 Derby Road. (Warning: Speed Cameras!) towards the town centre. Pass the cinema complex and at the roundabout take the third exit to A61 dual carriageway. At the next roundabout take the first exit at the Tesco’s roundabout. Gordon Lamb garage on the left. Donkey Derby on the right. At the next roundabout take the 3rd exit and drive along the B6057 Sheffield Road. You should be able to see the ground on your left just past Tesco’s entrance. The Chesterfield FC website shows a map where parking is available. 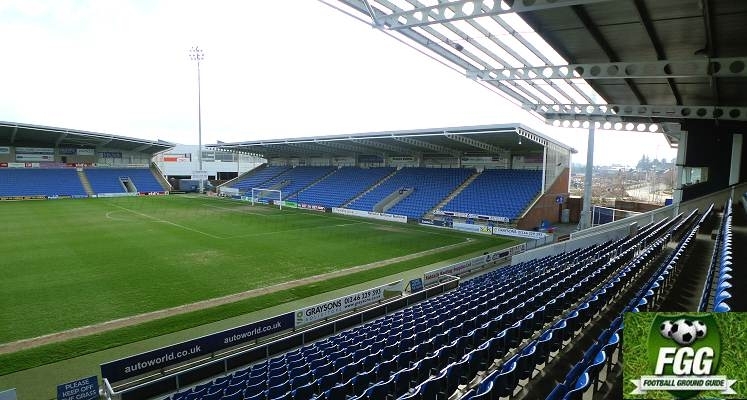 The Proact Stadium opened in 2010 and holds 10,600. Sky Blues supporters will be housed in the North Stand behind one of the goals. Leg room is very spacious and facilities such as toilets and refreshments have been built to a high standard. The view is unrestricted and the seats aren’t wooden (like the old stadium) so comfort is most certainly improved. 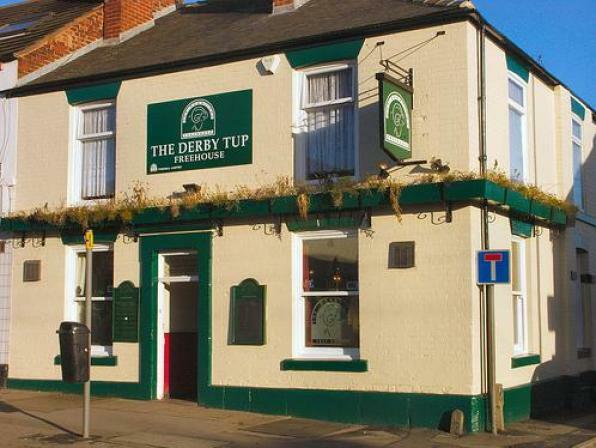 CCLSC members will be meeting again at the Derby Tup, 387 Sheffield Road, Whittington Moor, Chesterfield, S41 8LS, before the game. The licensee Ade, from the nearby micro brewery Pigeon Fishers, is looking forward to welcoming us back again. The Tup doesn’t serve food, but we are more than welcome to bring in sandwiches and pork pies from the butchers next door or fish and chips, from one of the three chip shops, which are within a couple of minutes of the pub. Beers change daily, but Ade said they have Harvest Pale and Timothy Taylor Landlord on permanent, alongside 8 other real ales, cider, lager and stout. The pub does get crowded on match days, as those who went last season will recall, but Ade knows that those travelling by train from London arrive into Chesterfield at 11.27, so several members plan to be at the Tup by opening time. To the ground: 0.4 mile, just under a 10 minute walk. Leave the Tup and walk down Sheffield Road to the ground. Enjoy the match and members who are going to the game don’t forget to send in your Man of the Match votes to Barry Chattaway via the voting form here.